Even local schools have been issued with a smoking quota for teachers, while one village was ordered to purchase 400 cartons of cigarettes a year for its officials, according to the local government’s website. The move, which flies in the face of national anti-smoking policies set in Beijing, is aimed at boosting tax revenues and protecting local manufacturers from outside competition from China’s 100 cigarette makers. China’s government has ordered massive government spending at both national and provincial levels to prop up the economy following plummeting demand for Chinese exports abroad, however imposing a cigarette quota is unusual. The nanny state has gone wild. Old people cost too much money to take care of. that is seriously fucked up, one more reason to believe in the depopulation conspiracy. In the USA they raise the price about $1 per pack.. If they dropped $0.50 they would go like HOT CAKES, and pay off the war in 1 year..
#4 – ECA – If they dropped $0.50 they would go like HOT CAKES, and pay off the war in 1 year..
Who would pay for the cancer treatment? Good thing they didn’t have a condom factory too. That argument dosn’t hold water. More up front cost yes. But still saves significant money in the long run. A few years fighting cancer early or decades extra fighting osteoporosis, arthritis, Alzheimer’s, ect ect. Not saying its morally right but it is numerically right. Smokes save on Medical bills. Pay the tax now, and I live 20 years less.. I quit smoking and live longer with OTHER problems..Heart replacement, New knees, HIP replacement, …..
What is to stop people from burning the cigarettes in a fire or just dumping them in the trash? The American health care system is build so that only those who (economically) worth it survive. Yeah, you’re right. Let’s kill off the population before they retire. Let’s lace the tobacco with melamine, so that we can speed up the process. And when we’re at it… make smoking mandatory for religious people. Just imagine what a difference three trillion dollar could have made if it had been spent on improving things at home instead of “liberating” the Iraqis. Im not saying its good or bad..
Just the TAX on cigs in the USA is about 90% of the price at this time..
And if you want the biggest boost..Cut tax on cigs and Alcohol, and you could pay off the national debt in 4 years from increased sales..
John should be talking about Electronic Cigarettes on the NoAgenda show. Healthier smoke. Cleaner Nicotine. and OH THE FLAVORS. Here kiddy kiddies. I have to disagree with you good buddy. The effects of cancer are far and away much more expensive than all revenues obtained from tobacco. In this neck of the woods there are several people with artificial jaws because they chewed tobacco. Others with holes in their necks from the throat cancer. Those with tracheotomies because of mouth cancer. And cemeteries with those who’s advanced cancers put them there before their time. I just recently learned of a woman I’ve known for many years who found out that cough was connected to a “spot” on her lung. It metastasized and is now in her liver. Her bill was over $30,000 before they decided it was terminal. and the cost of a NEW hip?? HOW about kidneys and dialysis?? at $4000 per month?? for 5 years?? If you figure $3 per pack, 1-2 packs per day, for 20+ years.. its true.. But not everyone gets cancer. And the money from the tax?? can go to improvements in HEALTH..including cutting COSTS. costs of medical equipment, and Abusive HMO schedules..
FINDING solutions and GOING BACK 20 years TO BETTER PRODUCTS that didnt kill us just to EAT. China has more smokers than the US has people?!? Wow, that is amazing. When you have that many people you need to encourage early death. As f’d up as this seems to us, I can actually see their logic. Generate immediate tax revenue now, shorten average life span in the long run. And given that China can’t even make a plastic toy that is not cancer causing, I would bet their cigs are going to kill you twice as fast as US made ones. #6 makes a good point though…why not force people to buy birth control too. Considering how much the Republicans are poo-pooing universal health care AND that hospitals would end up charging $200 for a regular 200mg Tylenol if implemented, that trillion dollar would have been blown up in smoke. If taxes on tobacco were really meant to deter people from smoking, they wouldn’t be used to fund completely unrelated programs like preschool. China’s new dual Economy Boosting, Population Control Initiative. 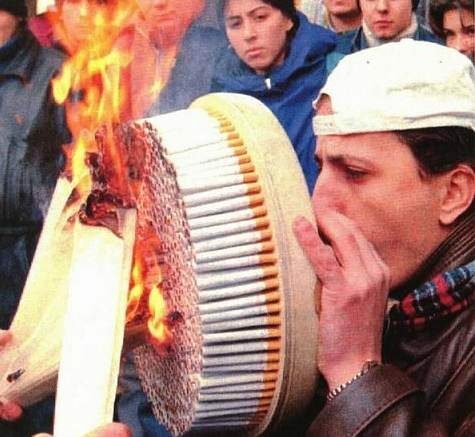 Tax on Cigs, should be bringing in $100,000+ per day, EASY. But as andrew Jackson said about TAX.. It costs over 1/2 the tax to collect the tax. there are to many HANDS along the way. Now there’d be a real reason to party if the Chinese government ordered everyone to drink more beer instead. Hey is pot illegal to smoke in China? #21, yeah, it’s actually kind of disgusting that politicians rely on the relatively low demand elasticity of drug addicts to grow tax revenues.